I think it would've been Simon Mensing. Roaring success that one! 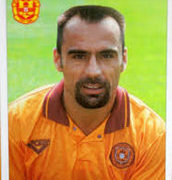 Myself and a friend of ours had a wager that pre-season over which player would go on to have a better Motherwell career - Simon Mensing or Kenny Connolly. Kenny Connolly sent me on a wikipedia rabbit hole spiral. I didn't realise Luke Watt was still only 21. I would have guessed about 24. I'm starting to talk myself into going to Celtic Park next week. Parkhead is always a bad idea. much is it these days? £30? Celtic tired and demoralised after a Europa League exit in Spain days earlier, young Motherwell going into it on 6 in a row after pasting Hearts. Stage really is set for a mindnumbing 2-0 defeat. £28 to sit in that shitey corner behind a pillar. It's a pass from me. A Dundee fan has travelled for more than 80 hours to watch his team play this season - failing to see a home league win. Gair Anderson, who lives in Hong Kong, has watched the Dark Blues play nine times this campaign. Last season, he bought a season ticket for the Dens Park club but only made it to one match, a defeat to Motherwell. I'm convinced we now own Dens Park tbh. Is it sexist to suggest this idea of renaming ‘Motherwell Ladies’ to ‘Motherwell FC’ confusing and stupid? Wouldn't say it's sexist at all, I just don't understand how it is confusing. When the reserves are playing later, it'll be clear that it isn't the first-team, don't think it'll be any different with the women's team. The aim isn't too appease any PC brigade, it's just to help highlight a squad that put in a great deal for MFC. The coverage won't change, those who don't have any interest won't be seeing a deluge of updates on the women's team, it'll stay as it has been for the last season. I thought the reaction to the announcement was pretty crazy, most of it from fans of other clubs too. Ferguson, Donnelly and Livingstone are the only over 20s in the Reserves today I think. Interesting (not really) to see Semple's captaining the side. Wouldn't say it's sexist, no. Are you of the opinion it's confusing and stupid? If so, do you mind me asking why? I'll be honest - I have absolutely no interest in women's football. I don't watch it, rarely take any notice of it online etc. I can't imagine, however, there will be a time when I'm confused between the two teams. Pretty much. It really depends on how the confusion is articulated or the reason it's considered 'stupid' that defines whether it's sexist or not. Being confused by it is really just a comprehension issue. I'm genuinely struggling to see how anyone can work themselves into a shoot about it tbqh. I didn't realise there had been a negative reaction to this TBH and can't really believe it's something anyone would get worked up about (unless it's twitter-based in which case, I can totally believe it). I saw the announcement, thought "fair enough", enjoyed the fact that Alan Campbell was the 2nd smallest person in the photo and moved on. Surely the sum total of the impact of this is that in woman's football fixtures, results and league tables it will just say "Motherwell FC" instead of "Motherwell Ladies FC", or am I missing something? It's unlikely to lead to confusion unless the men's and ladies' teams end up playing against each other competitively in some dystopian future of the SPFL. That's exactly it. The club actively promoting their women's team will only assist going forward in their recruitment etc going forward too. Sadly the Twitter response provoked attacks on appearance, gender and sexuality - it got very grim, very quickly.